[Updated at 9:02 p.m. ET] Tropical Storm Gert is gaining strength as it barrels toward the Atlantic island of Bermuda, the National Hurricane Center said Sunday. The storm system was about 255 miles south-southeast of Bermuda and "slowly strengthening" as it heads north, according to a 5 p.m. advisory from the center, which is part of the National Weather Service. Equipment aboard U.S. Air Force aircraft recorded maximum sustained winds of 45 mph, with stronger gusts reported. Gert's eye is forecast to go near or just east of Bermuda on Monday afternoon, prompting a tropical storm warning for the island. No other islands are similarly threatened, and the storm is expected to eventually turn northeast back out over open sea. Detectives in southern California searched Sunday for clues to crack the case of a stolen piece of artwork by Dutch master Rembrandt van Rijn, thought to be worth some $250,000. The theft occurred when a curator was distracted by another person, who appeared interested in buying something, said Steve Whitmore, spokesman with the Los Angeles Sheriff's Department. Another turbulent week ahead for investors? A number of factors - including concerns about debt in Europe, the U.S. economy and Standard & Poor's decision to downgrade the United States' credit rating - could make this another wild week on Wall Street, CNNMoney contributor Ken Sweet writes. Stocks took big downward and upward swings last week - the Dow Jones Industrial Average dropped 635 points Monday, rose 420 the next day, fell 520 points on Wednesday and jumped 420 points on Thursday. When it all settled, the three major stock indexes ended the week down by an average of 1.5%. Members of a well-known hacking group - according to a statement and Twitter messages - took credit Sunday for an online attack targeting San Francisco's embattled transit system. This is in response to the system's decision to cut off cellphone signals at "select" subway stations in response to a planned protest last week. On Sunday afternoon, a link off BART's website to myBART.org apparently had been hacked. It showed a page featuring, among other items, the Anonymous logo - a smirking mask above two crossed swords, all on a black background. The lawyer for a U.S. man being held in Aruba in connection with the case of a missing American woman urged authorities on Sunday to release his client. Gary Giordano, 50, was arrested by Aruban police on August 5, three days after Robyn Gardner, 35, was last seen. This weekend, authorities said that crews searching for the missing woman have looked in Aruban phosphate mines. A stage collapsed during a storm Saturday night at the Indiana State Fair's Sugarland concert. At least five people were killed Saturday night at the Indiana State Fair when a massive wind tore down a concert stage, authorities said. Indiana Gov. Mitch Daniels described the collapse as a "freakish accident." Watch an iReport shot by someone who captured the stage collapsing. "You could see a lot of people panicking," said Aaron Richman, who witnessed the incident in Indiapolis. Deafening screams were heard over the crumbling of the main concert stage. "All the scaffolding and speakers - all that came crashing down - and the whole stand just collapsed." Allison Hoehn said many in the crowd rushed to try to help people trapped under the debris. "We tried to get down to help, but no one was moving," she said. 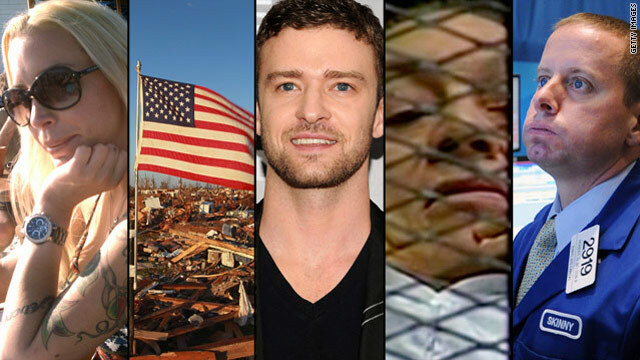 "The storm came on so fast and the stage just snapped like a toothpick." Spectators grabbed parts of their seats to assemble makeshift stretchers, Hoehn said. "Everyone rushed to help, and we saw people searching and pulling people out," she said. "(I) saw five people go away on stretchers. It was amazing how many people ran in to try to lift the scaffolding." As crews sifted through the rubble late into Saturday, on Sunday Indiana State Police Sgt. Dave Bursten reported that in addition to the fatalities, at least 40 were injured. "It's a very sad day at the state fair and our hearts are really breaking," said Cindy Hoye, the fair's executive director. Investigators are trying to figure out the cause of the collapse. 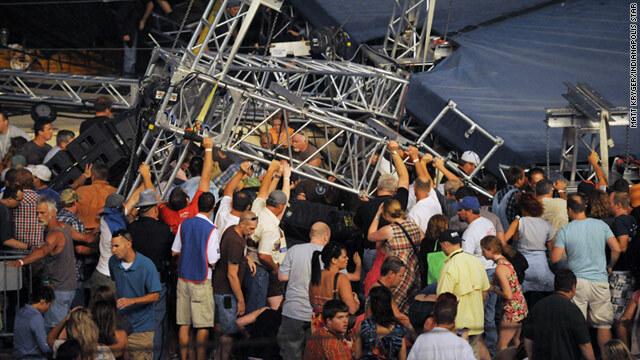 A stage at the Indiana State Fair collapsed Saturday. At least a dozen were hurt, according to the Indianapolis Star newspaper. The country music duo Sugarland, who was slated to appear on stage Saturday, tweeted that they were okay: "We are all right. We are praying for our fans, and the people of Indianapolis. We hope you'll join us. They need your strength." A witness told CNN that inclement weather played a part in the incident, which was posted on Youtube. "A big gust of wind came through. You could see a lot of people panicking. All the scaffolding and speakers - all that came crashing down - and the whole stand just collapsed," Aaron Richmann said. Video from CNN affiliate WTHR showed flashing lights and emergency vehicles on the scene. The weather service said thunderstorms were possible for the area Sunday. Filed under: Indiana • U.S.